Performance pay is a tricky business. If you hired me as a hedge fund manager and paid me “2 and 20” – a 2 per cent management fee, plus 20 per cent of any gains – then I’d be tempted to take your money to a roulette table and put it all on black. If I won, I’d get to keep 20 per cent of the gains. If I lost – well, I would have been sure to deduct the management fee first. If I were instead aiming to top a league table of investment managers, worse awaits. This time, instead of betting on black, perhaps I’d put the money on lucky number seven. If the rewards go to the most successful investment managers, then I need to go for broke – especially since “broke” is more likely to describe my investors than me. All this is an exaggeration, of course, but discussions of bankers’ bonuses are haunted by visions of this kind of perverse “compensation” scheme. (Annoyingly, we use the word “compensation” as though bankers were being awarded damages after the trauma of executive life.) The popular view of bankers’ bonuses is simple enough: they never deserved to be paid millions anyway, and the fact that they seem to have blown up the world’s economy proves it. A more sophisticated view does not worry about the size of bonuses, as long as they attract sufficiently brilliant people. If they do, they are worth paying; that is true whether they are paid by shareholders or by taxpayers. But it now seems likely that bonuses do not do these wonderful things, and may simply encourage gambling. I was writing about these risks before the credit crunch, and I was hardly alone – in September 2005, Raghuram Rajan, then chief economist of the International Monetary Fund, was warning that “skewed incentives for investment managers may be adding to global financial risk”. I fear this is a problem easier to identify than fix, but it may be possible to design sensible bonus schemes. Research from three German economists, Thomas Gehrig, Torben Lütje and Lukas Menkhoff, shows that bonuses for fund managers seem to produce harder work and more attention to fundamentals, but not greater risk-taking. The study did not look at banking, but it does suggest that sensible bonuses are feasible. Politicians are beginning to take note. Gordon Brown now says that regulators “should be given the right in regulation to penalise a bank which is basing its reward system on short-term deal-making rather than long-term performance”. Fine, but I would expect no miracles. Shareholders also prefer long-term performance to short-term deals, and if they did not previously realise the risks that bankers were taking with their money, they do now. But there is a reason that regulators might do a better job than shareholders. The typical shareholder owns a tiny portion of any one company, and is unlikely to find it worth the trouble trying to organise a rebellion against irresponsible pay awards. Like the hapless restaurant diner at a big party, facing a menu in the full knowledge that the bill will be split between 30 or 40 other people, the shareholder realises that there is little point in scrimping when everyone else will order steak and champagne. A regulator could bring more discipline – if a sufficiently capable one exists. So could a large shareholder: the economists Sendhil Mullainathan and Marianne Bertrand have found that CEO pay is linked much more tightly to credible measures of performance when there is at least one substantial shareholder to take the policing role. For the banking industry, governments can no longer escape that responsibility. Here in India – as in most other parts of the world – there is an assumption that all politicians are corrupt. As such, politics is not the first career choice for most individuals. However, if all politicians are indeed corrupt, wouldn’t that mean that all politicians benefit more than the rest of us? Therefore, shouldn’t the rational choice be that more people join politics? And would “competition” reduce corruption? You are clearly thinking along the right lines, but the details can be more subtle. I asked Mikhail Drugov, an expert on the economics of corruption from Oxford University, for advice. One of his observations is that politicians may not necessarily make more money from a corrupt system. If, for example, you wish to exploit a political position for personal gain, you may find that to obtain the position, you must pay a substantial bribe to some other politician. On balance, even the most venal political neophyte may decide it is easier to make money by getting a proper job. Competition may reduce bribes: as the economist Robert Klitgaard famously commented: “Corruption equals monopoly minus accountability plus discretion.” It’s hard to charge a bribe if the official in the next office will perform the same service for less. But competition does not always reduce corruption. The number of bribes required may rise, even as the size of the bribes falls. And corruption can secure illegitimate services as easily as legitimate ones. Should we be pleased if it becomes cheaper to obtain a driving licence when one cannot actually drive? When competition does reduce corruption, it is very good news. In such cases, the most feared phrase in politics should be “bipartisan agreement” – for which read “cartel”. A little bird tells me that the paperback of The Logic of Life is now on the front table in Borders in the UK. Official publication date is Thursday 5th March, but don’t feel you have to wait! Do please consider buying a copy. Other economists – again, in the US – have made similar discoveries. Shane Jensen and Stephen Shore examined the oft-made claim that household income (an indicator of spending) is more volatile in modern times. They found that this is actually only true for the rich: the proportion of US national income earned by the rich surged ahead in the booms of the 1980s, 1990s and 2000s, but stuttered or even fell in the recessions that separated them. My aim is not to sympathise with the well-off: while no doubt it stings to take the kids out of private school or to sell the sports car at a loss, most people never enjoyed such privileges in the first place. But this research highlights a truth often forgotten in the hand-wringing about the downturn: everyone has their own experience of a recession. Some do badly and others do very well indeed. The gloomy averages we usually see reported fail to convey that range of experience. Lindsey Macmillan, an economist at Bristol University’s Centre for Market and Public Organisation, kindly investigated this question for me. She looked at data from the British Household Panel Survey, which in 1991 began regularly to monitor the experiences of several thousand families. Macmillan found that more than half of households were earning appreciably more in 1993 than in 1991, and that one in six had seen their income rise by more than half during two years of very low average growth. The figures were much the same between 1994 and 1996, when the economy was expanding briskly: in other words, the variability in individual experience completely drowned out the distinction between growth and stagnation in the underlying economy. For businesses, too, individual circumstances vary greatly. We are used to being regaled with tales of booms in niche markets: the Financial Times has reported success for manufacturers of frozen food, for physiotherapists, and for a company that sells food past its “best before” date. All doubtless true, but even within a sector there will be winners and losers. Jonathan Haskel of Imperial College, who has access to confidential data on business performance, has found that companies in the most productive tenth of UK manufacturers, in any given industry, get five times more output from each worker’s time than the sector’s least productive 10 per cent. The lesson for any business is to recognise that each customer, client and supplier is having his or her own private experience of the recession and that, for some of them, that experience is surprisingly benign. A business that can distinguish between its struggling and its prospering clients is likely to have an advantage. The co-author of Freakonomics, Stephen Dubner, recently called my attention to a $975 calf-leather sewing kit, designed to “keep tailoring bills in line”. Evidently, not everybody is suffering in this recession. Can you help me win the lottery? I have started playing the national lottery in an attempt to resolve my worsening financial situation. While I am aware of the improbability of winning, I was wondering if I would improve my chances by sticking with the same numbers rather than using the randomly generated “quick pick”? You seem to have a rather charming scenario in mind, with you playing the role of a little lost child, and the lottery machine playing the role of parent, diligently searching for you. This is called a “rendezvous problem”, and, in general, you would be better off staying where you are and letting the lottery machine find you. With almost 14 million combinations to try, this would take, on average, seven million attempts – about 67,000 years if you play twice a week. Success would be guaranteed after 135,000 years. If you choose your numbers at random, however, success is never guaranteed, and tame mathematicians tell me that the average time to strike lucky is also longer – perhaps 100,000 years or so. But whether you can shave 35,000 years off is beside the point. The lottery machine is not trying to find your number. It has no memory of previous combinations, and is equally (un)likely to pick any of the 14 million. Pick at random, write down your birthday … it makes no difference to your chance of winning – although if you write down unusual numbers, it will minimise the likelihood that if you win, you’ll have to share your prize. In case you are not a long-time reader, I will repeat my advice as to how to enjoy the thrill of the lottery without the fool’s bet. Choose your numbers, but don’t buy a ticket. You’ll win almost every week – the fear that your number might actually come up is an adrenaline rush to beat them all. Does nobody want to take money from the poor? The credit crisis has provided a series of unpleasant lessons about the importance of financial services. The first lesson was about credit: we began to realise that it would not always be possible to extend our overdrafts or refinance our mortgages cheaply. The second lesson, as queues formed outside Northern Rock, was about savings: there is no iron law of economics that says that the money in your savings account is 100 per cent safe. Last September, those of us still peeping through our fingers at the financial news learnt a third lesson, about the payment system itself: it began to be conceivable that you might write a cheque and the cheque would bounce, not because you lacked the funds to honour it but because your bank did. The same lessons are being learnt in a different context, that of financial services for the very poor. In the 1970s, pioneers in Latin America and Bangladesh – most famously Muhammad Yunus of Grameen Bank – demonstrated the importance of affordable credit for the poor, and discovered that poor borrowers could reliably repay loans. The early experiments grew into a worldwide microcredit movement. But just as we were rudely reminded that there is more to our banking system than cheap mortgages, so microcredit experts have been realising that there is more to microfinance than loans for the poor: savings, insurance and payment systems matter too. The trouble with living on two dollars a day is that you don’t actually get two dollars a day. One day you might get five, then nothing for the next three days. Income is unpredictable. Outgoings, too, are irregular. Emergencies crop up. Under the circumstances, the most basic financial product, such as an easy-access savings account, would be invaluable. We know about this thanks to a new study by Daryl Collins, Jonathan Morduch, Stuart Rutherford and Orlanda Ruthven, detailed in their forthcoming book, Portfolios of the Poor. These researchers compiled financial diaries for more than 250 families in Bangladesh, India and South Africa, tracking the tangle of transactions over the course of a year. They discovered that poor families are intensive users of financial products. Take the case of Hamid, an occasional rickshaw driver, and his wife Khadeja. The couple live in the slums of Dhaka with one child. The researchers found that Khadeja and Hamid use a bewildering array of financial instruments. They have a small life insurance savings policy; Hamid deposits money with his boss at zero interest, patiently accumulating a lump sum large enough to send back to his home village for safekeeping; Khadeja takes care of money for two neighbours with spendthrift husbands; the couple have borrowed money from friends, from a microcredit bank, from Hamid’s boss and from a local shopkeeper. Khadeja even took out a pricey loan to fund her saving: she bought gold, an asset she could use if Hamid died or divorced her. Hamid and Khadeja need this patchwork portfolio in order to manage the daily gap between income and spending. They would benefit a great deal from access to a cheap savings account. Pent-up demand for such accounts is so great that in some areas deposit-collectors are able to charge for the privilege, collecting a hefty negative interest rate of 3 per cent a month. Still, there is progress. In the Philippines and Kenya, payment systems are emerging on the back of mobile phone networks, with phone companies turning into deposit-taking banks. That is a promising development, but it requires a deft touch from regulators. Another hard lesson from the credit crunch is that deftly regulating banks is easier said than done. Should I marry my boyfriend? I have a great boyfriend. We’ve been together for five years, have a son and are planning more kids. I have a good job which I would like to continue doing and that pays OK. My boyfriend earns a lot more money than me and we have a very comfortable lifestyle. We are both in our early thirties but I am worried that after three kids and 10 years with me, he’ll run off with a younger woman. Should I marry him? Economists have gathered evidence from speed dating and internet dating, and found that it supports the conventional wisdom: men like young women and women like rich men. Clearly, you have reason to be nervous. I keep re-reading your letter and I cannot work out whether you regard the risk of desertion as a reason to get married or a reason not to. No matter: a spot of game theory, which economists use to understand how rational people interact with each other, may help you here. You have three options: dump him now; stay with him but do not get married; or get married now. Ten years later he will respond by staying with you or leaving you for the nanny. Dumping him seems odd: you already have a child together, you enjoy the relationship, and dumping him will not change the unpleasant logic of evolutionary psychology, which puts you at an increasing disadvantage as you both grow older. Staying with him seems more sensible, but if he does run off you will have limited negotiating power. Marrying him seems best of all: the legal contract, in most jurisdictions, protects you against this sort of behaviour. You cannot prevent him leaving you, but you can make it an expensive proposition for him if it happens. Do I hear the distant sound of wedding bells? Happy Valentine’s Day. 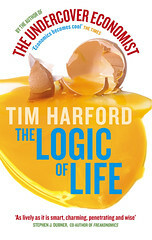 Price-sensitive lovers of economics books may want to know that the paperback of “The Logic of Life” is now out in the US. (In the UK, one more month to wait.) You can buy it here; you can read discerning reviews from the New York Times, the Economist, and many others here – people of taste, all. The book has been interpreted as the antithesis of Nudge or Predictably Irrational, an anti-behavioural-economics book, but it isn’t really that. It’s really a product of my love affair with economics, showing how it can usefully be applied to crime, marriage, poker and much else. Thumbing through the pages of the paperback reminds me how much I loved writing the book, so I’m glad that the collected book reviewers of America enjoyed reading it.